The sixth studio album by Status Quo was 'Hello! ', released in 1973. 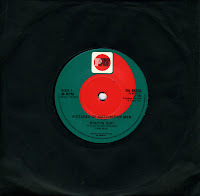 'Roll over lay down' was the first track on that album, but the only single released from 'Hello!' was 'Caroline'. 'Roll over lay down' still became one of the band's better known tracks, due to its single release from the subsequent live album 'Live! 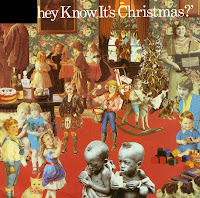 ', released in 1975. 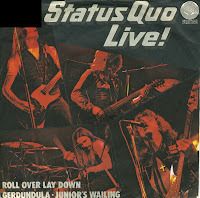 This live ep, featuring three tracks, reached number 9 in the UK singles chart and number 2 in the Dutch Top 40. I've often said that one of the most appropriate songs for my funeral would be 'Down down' by Status Quo. And then I discovered I didn't actually have the song. Now that I've heard it, I still think it would be a great soundtrack to those final moments. 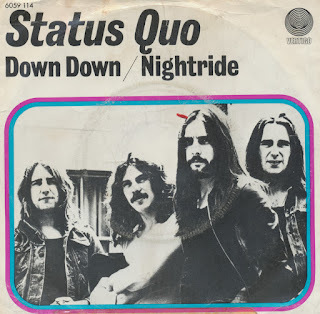 'Down down' was first released in November 1974. The track was taken from the album 'On the level'. The album version is more than 5 minutes long whereas the single version was edited to almost 4 minutes. The single was a number 1 hit in the UK, while peaking at number 2 in the Dutch Top 40. 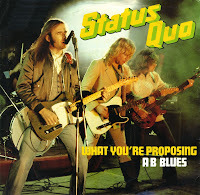 Status Quo released their album 'Just supposin'' in October 1980. It was produced by the band and John Eden. The album was recorded at Windmill Lane Studio in Dublin. The recording sessions yielded enough tracks for this album and the follow-up, 'Never too late', released just five months later. 'What you're proposing' was the first single release from 'Just supposin'', a dynamic rock track that grooves like a madman. It reached number 2 in the UK singles chart and number 7 in the Dutch Top 40. The Spectres, the Scorpions and Traffic: these three band names all preceded the name Status Quo between 1962 and 1967. 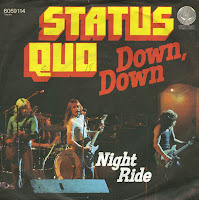 The core of the band was eventually formed by Francis Rossi and Rick Parfitt, who continued to work together after meeting in 1964. When they decided to call themselves Status Quo and signed a record deal with PYE records, their debut album 'Picturesque Matchstickable Messages from the Status Quo' was released in 1968. 'Pictures of matchstick men' became the band's first hit, peaking at number 7 in the UK singles chart and number 4 in the Dutch top 40. The B-side on this re-release 7" single is their next hit, 'Ice in the sun', which was written by Marty Wilde (Kim's father). That one reached number 8 in the UK and number 24 in the Dutch Top 40.